CARSON, Calif. (AP) -- No more giggling about trying to crack the top 100 in tennis' world rankings. A resurgent Serena Williams has a new goal now. Williams overcame the heat and her second three-set match in 17 hours to beat Meghann Shaughnessy 6-7 (4), 6-1, 6-4 on Friday and advance to the JPMorgan Chase Open semifinals. Playing her second tournament after a six-month layoff because of a left knee injury, Williams is unseeded and ranked 110th in the world two weeks before the U.S. Open begins. "I'm reaching for the top 50," she said, smiling. "Maybe I'll get there, I think I'm definitely worthy." Maria Sharapova, seeking her second title in as many weeks, defeated fifth-seeded Dinara Safina of Russia 6-2, 6-4, extending her winning streak to eight matches. She has yet to drop a set. In Saturday's semifinals, she will take on third-seeded Elena Dementieva, a 4-6, 6-1, 6-1 winner over wild card Bethanie Mattek, who sported pink knee-high socks similar to the style she wore in a first-round Wimbledon loss to Venus Williams. "She's very focused. It's all about her concentration," said Dementieva, who is 1-5 against Sharapova, including losses at Indian Wells and Wimbledon this year. "She plays every ball like it's the last one and she doesn't give you an easy point. You have to work hard against her." Sharapova avenged her three-set French Open loss to Safina, breaking her five times in the 1 1/2 -hour match. Williams returned for a day match Friday after putting away seventh-seeded Daniela Hantuchova 1-6, 6-3, 6-3 in the third round Thursday night. The on-court temperature registered 98 degrees, but neither Williams nor Shaughnessy took advantage of any heat breaks. "It wasn't hot to me at all," Williams said. "I felt a nice breeze and once I put my hat on, I was fine. I live in Florida so this is really, really nice weather for me." 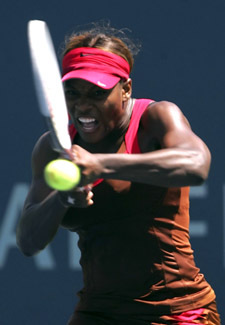 During the match, Williams' father Richard did a television interview in which he said his daughter's left knee "is hurting a lot." Afterward, she begged to differ. Williams explained she dodged her father's question because she didn't want to get into it with him, adding that her positive response referred to her left ankle, which she rolled Thursday. Both her ankles were taped Friday, and she said the left one "felt really good." Williams' serve was markedly improved from the previous night. She fired 12 aces and had one double-fault. She overrode 34 errors by hitting 50 winners. There were no service breaks in the first set, then Williams broke three times in the second. "I had a big letdown in the first part of the second and she started going for her shots," Shaughnessy said. "She hits with a lot of power and moves very well." Williams broke to go up 5-3 in the third. Shaughnessy broke back in the ninth game -- Williams' only loss of serve in the nearly three-hour match -- to trail 5-4. But Shaughnessy double-faulted on Williams' second match point. "It's very disappointing not to be able to come through," she said. "I'm hitting the ball well and it's just a matter of stepping it up at that key time. It's all mental. I just need to believe." Williams was cheered on by her parents, sister Venus, who is resting her injured wrist this week, former Los Angeles Lakers player Rick Fox and Olympic track star Carl Lewis. "What I'm most proud about is I'm not tired," Williams said. "Usually after a long match, I get sore. I don't feel that way at all. I'm really relaxed out there." She will play 16th-seeded Jelena Jankovic of Serbia and Montenegro, who beat 10th-seeded countrywoman Ana Ivanovic 6-4, 7-6 (6). Ivanovic fell to 0-5 in quarterfinals this year.